Falvey Memorial Library :: Where in the world are the books in Falvey West? Where in the world are the books in Falvey West? 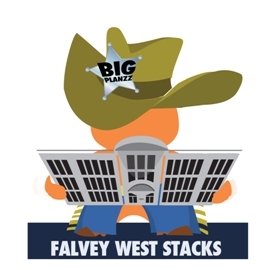 We had big “boots” to fill in Falvey West, and fill them we did. After we moved the journals in 2010, we had the shelving space thoroughly scrubbed and freshly painted. Still, some folks had trouble finding their way to Falvey West, so we mounted large signs on the Falvey first floor. As you enter the Library, head north (straight); then turn left (west) before you reach the Griffin room. Falvey West (ground – 2nd floor) contains main stacks books with call numbers A – D. All other main stacks books are on the 3rd and 4th floors of the main library building. Directional signs have been posted on each floor of Falvey West to help pioneering patrons get around. We’ve also added a computer to each floor for searching the catalog or trying our interactive map. Still have questions? Mosey on over to the front desk!